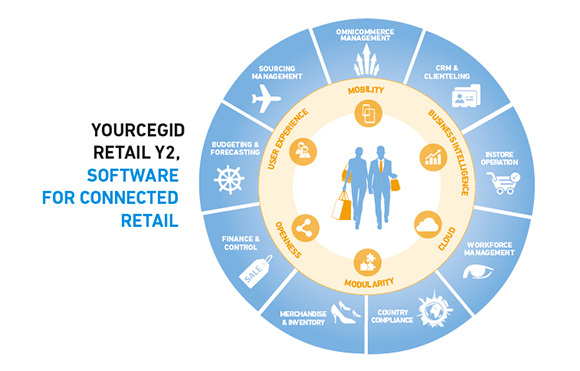 We provide Yourcegid Retail Y2 from Cegid. Y2 is a versatile, modern and scalable EPoS and retail management system. We help you bring your overall store management actions into this one intuitive solution. Take advantage of this outstanding Cegid software that has helped thousands of retailers stay ahead of the competition and meet the ever-changing demands of their customers. Using real time technology, Cegid software scales from a single store environment right up to multi-national retailers. Enable your sales associates to better serve your customers and be more efficient with Y2’s fully featured fixed and mobile Point of Sales (POS) solutions. Delight your customers with Y2’s consistent experience whether in-store, online or mobile. Get closer to your customers and drive increased sales by putting the customer experience at the heart of the process with Y2’s extensive CRM and Clienteling features. Never miss a sale with Y2’s real-time visibility of your inventory across your entire business, automatic replenishment, and store/warehouse transfer functionality. Make better decisons and gain deeper insights with Y2’s easy to use dashboards, reports and analysis tools.